Athens, Ga. – The Circle Gallery at the University of Georgia College of Environment and Design will host an exhibit of the work of Betsy Cain and David Kaminsky, entitled “Wrack and Ruin and the Creative Response: A Cautionary Environmental Tale” Feb. 6-March 12. A public opening reception will be held Feb. 6 from 4:30 to 6 pm in the gallery. The exhibition will feature original paintings and drawings, photographic extrapolations and film documentation by Cain and her husband, photographer Kaminsky. Since 2007, the pair has been responding, as residents of the estuary and as artists, to the environmental impact of a neighbor’s 980-foot dock that reaches out into the shallow tidal estuary of Tom’s Creek on Wilmington Island in Savannah. Depending on the length of time the wrack stays, the rhizomes or roots of the Spartina can be killed off as well, effectively denuding the area of the one sustaining life force that is so integral to the marsh’s survival,” she said. 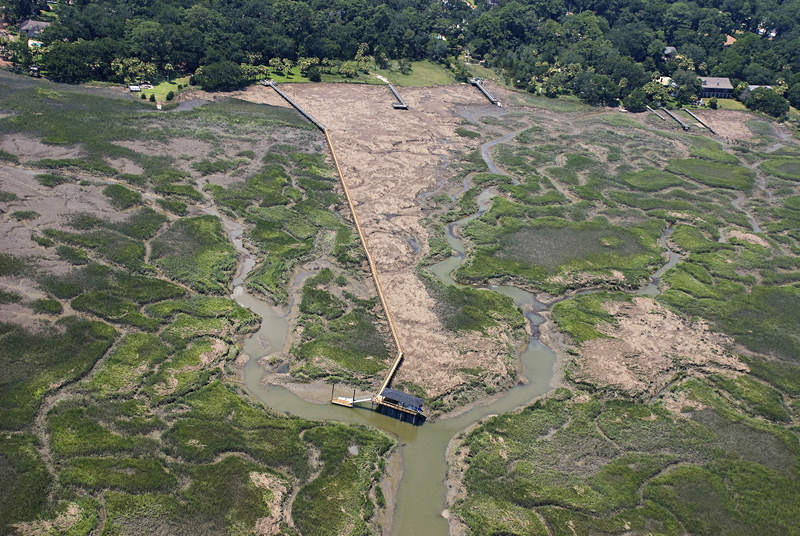 Their ongoing efforts have inspired action including a local community-level conservation effort and a public dialogue about the ethics of development in the coastal marshes. Cain is a visual artist and environmental activist living on the marsh on the coast of Georgia. Her work is represented in the collections of the High Museum of Art, the Telfair Museum, the University of Alabama at Tuscaloosa, and the Roswell Museum and Art Center in Roswell, New Mexico. Landscape architecture students from the College of Environment and Design will be assisting Cain and Kaminsky in the installation. The exhibit is sponsored by the College of Environment and Design, CED Dean Dan Nadenicek, with additional financial support from the Environmental Ethics Certificate Program directed by Dorinda Dallmeyer and the Georgia Power professorship held by Alfie Vick. The Circle Gallery, which is free and open to the public weekdays from 9 a.m. to 6 p.m., is located in the Jackson Street Building at 285 S. Jackson St. on the UGA campus. There is paid public parking in the adjacent North Campus Parking Deck.